Between my boyfriend and I we own: a MacBook, a MacBook Pro, an iPhone 3GS, an iPhone 4S, the New iPad, an Apple TV and an Airport Express. There is also a first generation iPod Touch in my bedside locker drawer and a second generation iPod shuffle in his. It is safe to say we have invested in the Apple lifestyle. 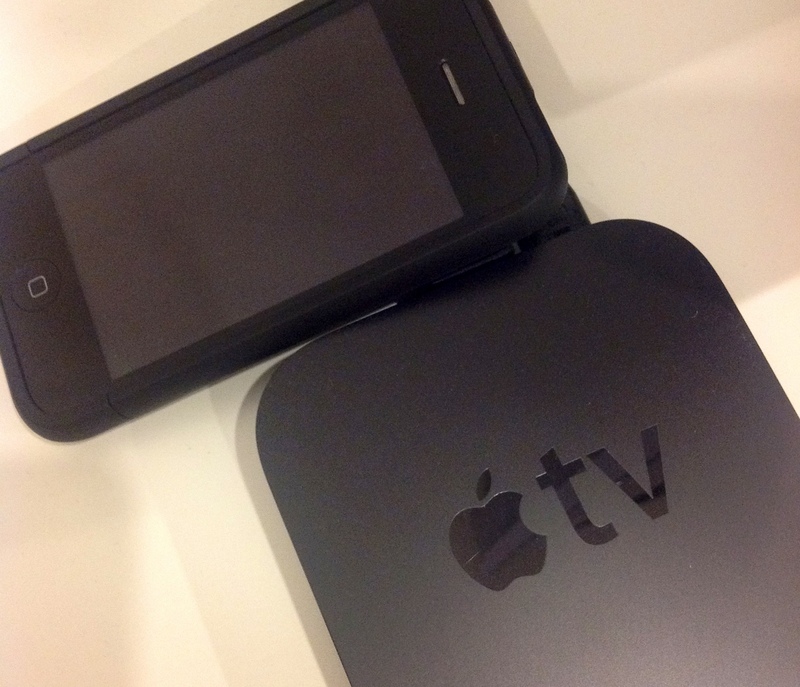 The Apple TV was the most recent addition, rounding out the Apple family in our home. It cemented the company’s firm grip over every facet of our entertainment and online recreation. So how’s it all working out? First of all you should know that I don’t pirate any music or movies. I buy everything from iTunes. This works for me because I can watch or listen to anything on any of my devices. I believe that once you commit to the system it works out really well. There are instances when something isn’t available on iTunes but out on DVD or it hasn’t been released in this country. I get frustrated but I believe that is more an issue with the entertainment companies than Apple (and that is a blog post for another day). At the Apple keynotes and in the ads we are presented with these happy multicultural people wearing bold colours enjoying life with their apple products and the entertainment offered by the iTunes store. Once you buy into iTunes – your life ends up just like the ads. Your content is available to listen to on your commute, play through speakers in the bedroom and watch on your TV in the living room. For me the flow between devices is enough of a reason to spend the money in iTunes. Apple isn’t getting out of the entertainment game any time soon so I feel comfortable buying a movie iTunes knowing it will travel with me as long as I stick with iProducts. The spanner in the works gets thrown when I want to combine my Apple ID with my Boyfriend’s. It doesn’t mesh together well. Particularly with the Apple TV. Home sharing does its best to help but it is a big question. How do you bring together your digital entertainment life? And on the flip of that – how do you split it up if things go south? Separate external hard drives? Should I get a secret back up in case this relationship doesn’t work out?! It’s a good thing I have friends who will always be there for me. But what if unlike me, they aren’t willing to put themselves into debt for the latest gadget from Cuepertino? I can’t bring my iPad to a friend’s house and assume they have an Apple TV to stream Tangled to. iTunes doesn’t play nice with my friends setup. The short answer to this is to only befriend people who you meet in the queue for the new iPhone. The long answer is that investing in the Apple Ecosystem is fun and works brilliantly. However it is a solitary experience unless you always want to play host and show off how well AirPlay works in your living room. This entry was posted in Geek, Technology and tagged Airport Express, Apple, Apple TV, Content, Entertainment, Geek, iPhone, iTunes, MacBook by Jonathan Day. Bookmark the permalink.